I can take a better one I just need to make room somewhere for them to stand. But no, his legs can go straight BUT he falls down, he's rather top heavy with his huge noggin. What legs did you use for that Bane custom? Did you swap out the forearms too, it looks like there's a cut there? And how did you get the bicep swivels? 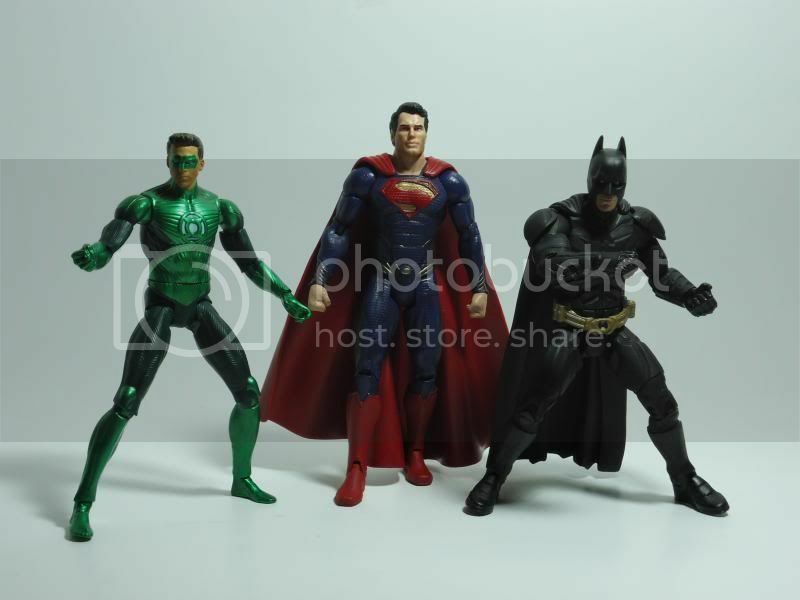 Looks like he used a DCSH Bane Body, DCUC Bane Hands and Boots, and a male buck DCUC legs for the legs...just guessing. Thanks, but any idea how he would've got the DCUC biceps onto the DCSH shoulders as there isn't a bicep swivel/peg on the DCSH arms? 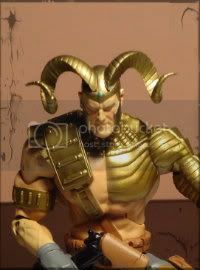 Also, would those be any DCUC waist/legs or are they from Ares as he's larger? No clue on the shoulder/bicep swap, but those look like the standard male buck legs...I think they just look bigger because they are attached to a larger boot and a larger body frame. Good eye on the legs. 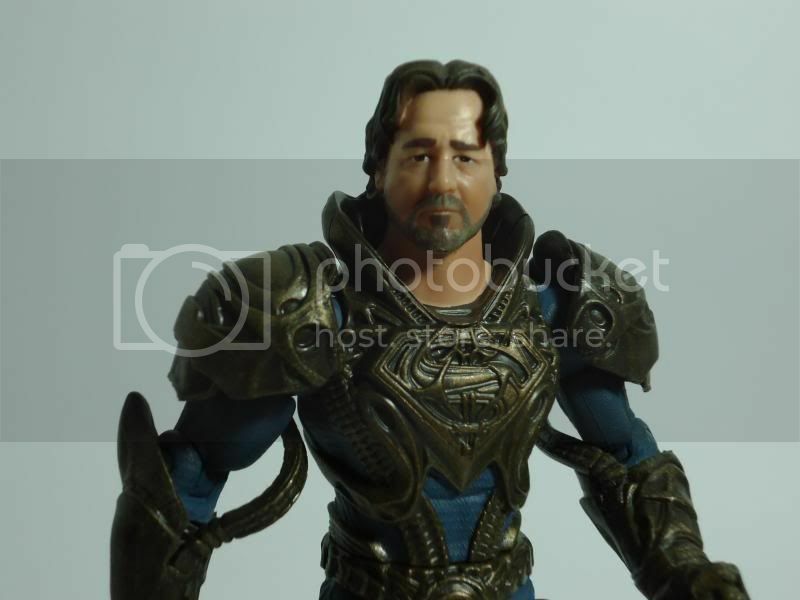 I was sick of Mattel doing either a Bane that was underarticulated or way too big. Especially since the 4HM could clearly easily make one similar to what I just did. My goal was to make it with the kind of torso you'd expect to see on Bane during Knightfall, with bicep swivels, and the DCUC style pelvis/hips. With the existing parts, I was looking to end up with a sort of cross between the comic version and TNBA animated version. I took the Bane shoulders and carved off the biceps, and once they were shaped the same basic way as the Crossbones shoulders, I screwed and glued a big metal screw into each shoulder to replace the Crossbones pegs from his shoulders. That's pretty sweet man, good work. Thanks! Now I just need to find someone to paint the torso and arms for me. When do all the other figures come out? Wave 2 or whatever? 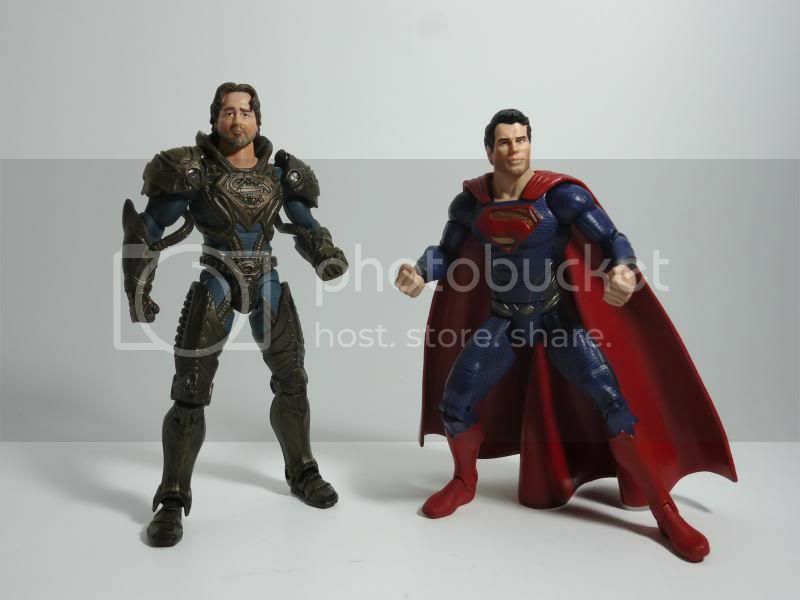 I have Superman and plain old Zod, and Jor-el on the way.